A 4-ounce serving of Japanese A5 Wagyu tri-tip at Niku Steakhouse. Some chefs wear their hearts on their sleeve. Steve Brown takes that to an extreme — wearing his passion prominently and permanently inked on his forearm. 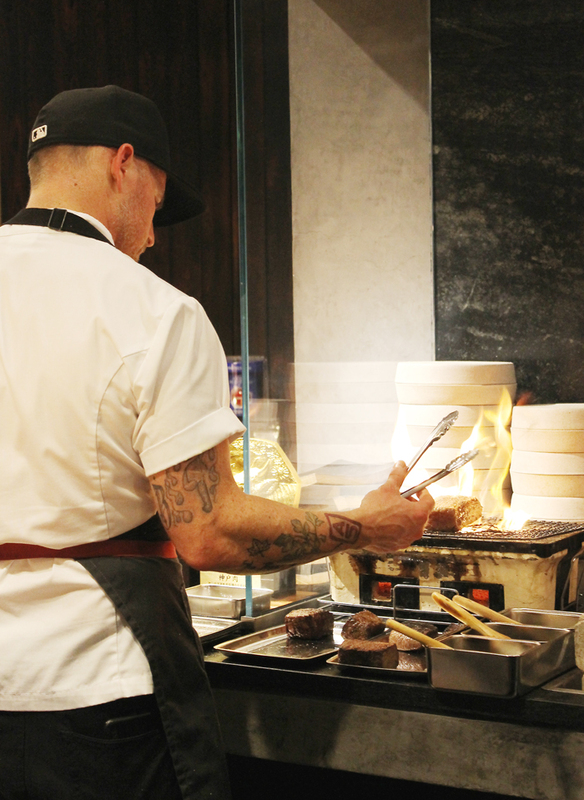 The executive chef of the splashy new Niku Steakhouse in San Francisco has “A5” (the highest grading for Japanese Wagyu beef) tattooed on his right arm, so there’s no doubt as to what his favorite ingredient is. You can see for yourself if you snag one of the 18 seats — truly the best seats in the house — at the counter that surrounds the massive grilling station. 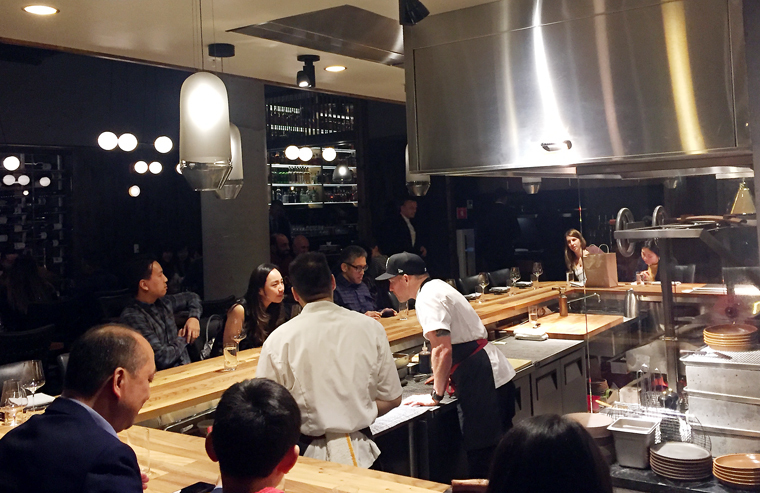 That was my vantage point recently when I was invited in as a guest of the restaurant, opened by the Omakase Group, about one month ago. 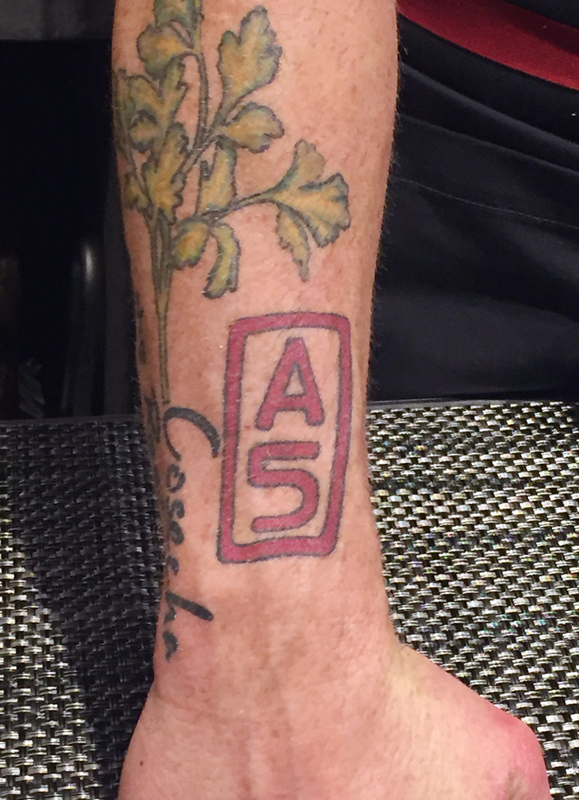 Executive Chef Steve Brown’s tattoo says it all. 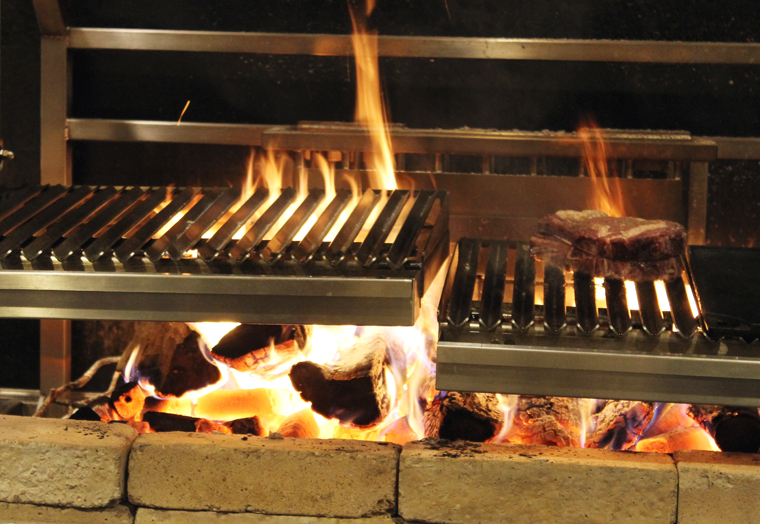 Sitting here is a primal, visceral experience, as you’re just inches from the flames of the hand-cranked main grill that can get up to 900 degrees to cook American prime steaks, and the small custom-built Japanese grill heated with binchotan white charcoal on which the Wagyu is seared. It’s like getting an up-close view with all the interaction you would at a sushi bar — but with serious fire involved instead. The seats at the grill are the best to snag. You feel the heat, hear the crackling sizzle, see sparks fly, and breathe in the smokiness of the beef all around you. It’s like getting high on beef. Chef Steve Brown manning the custom-made Japanese grill. A 3 1/2 pound tomahawk just off the grill. Put it this way: I rarely even eat steak normally, but I can’t wait to go back to this place because the beef was so out of this world and the experience just so much fun. The wine program is phenomenal, too. 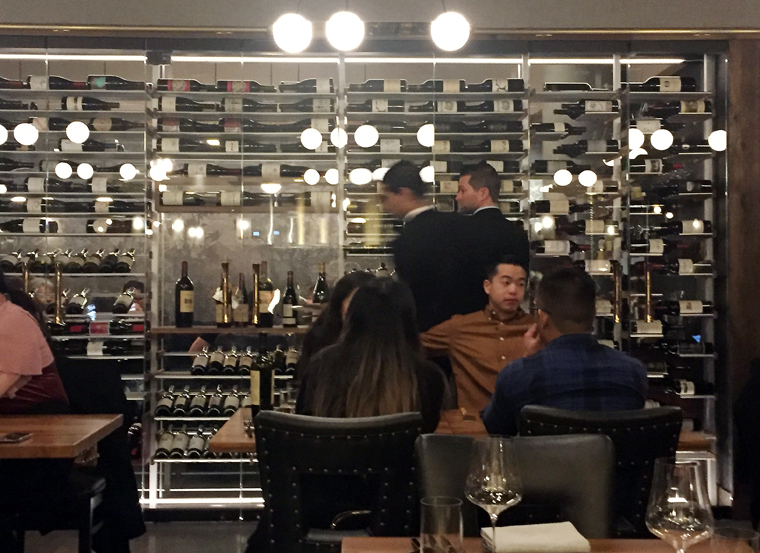 The horizontal bottles are displayed artfully on the back wall of the dining room. Every one of the 100+ wines is available by the glass, too, which gives you an opportunity to try vintages you may never have had before. The wine wall in the dining room. My husband went with a glass of the rich, intense 2016 Lo-Fi Malbec from Santa Barbara while I chose a glass of the elegant 2015 Matthiasson Refosco ($22) with lovely earthiness and soft tannins. 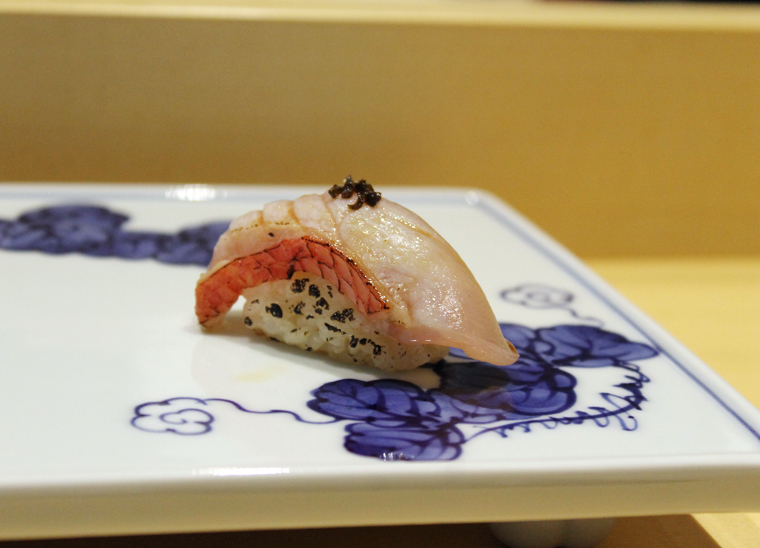 Like at a sushi bar, you can chat with the chef and the cooks behind the grilling counter. 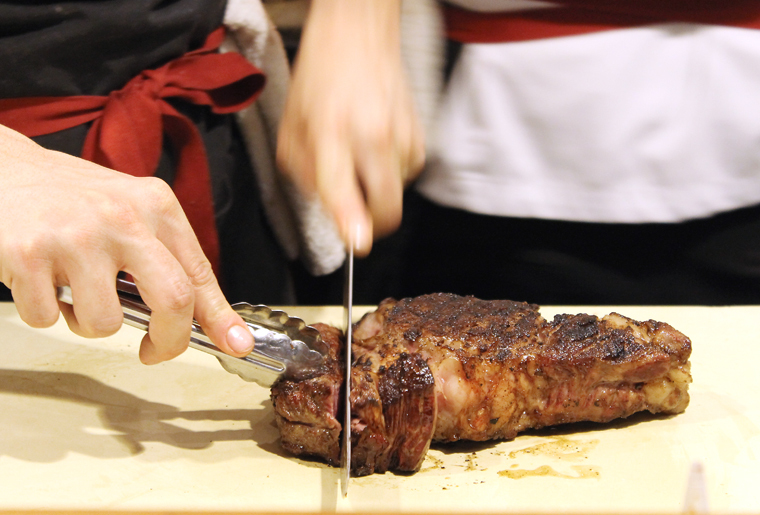 One of the most hilarious moments came at the end of the meal, where one cook, who had been grilling and slicing one behemoth steak after another in front of us, revealed that he’s actually vegan (though, he does taste everything for his job). 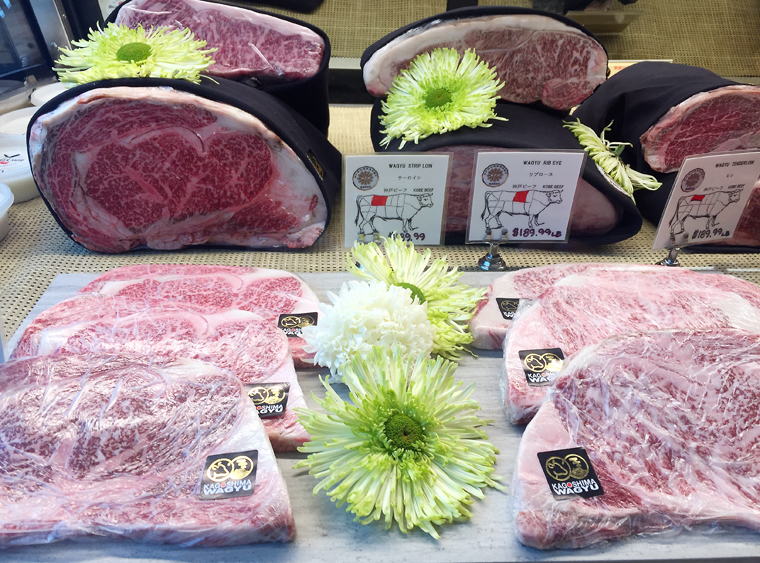 Brown, founder of the Wagyu-centric supper club CosechaSD, has toured the Wagyu prefectures in Japan and has one of only about a dozen Hyogo Kobe Certifications in the United States, allowing him to serve beef from that prefecture. The gold certificate is on display right near the binchotan grill. When you sit down at the counter, he will chat with you about the beef, including mentioning a few off-menu items. 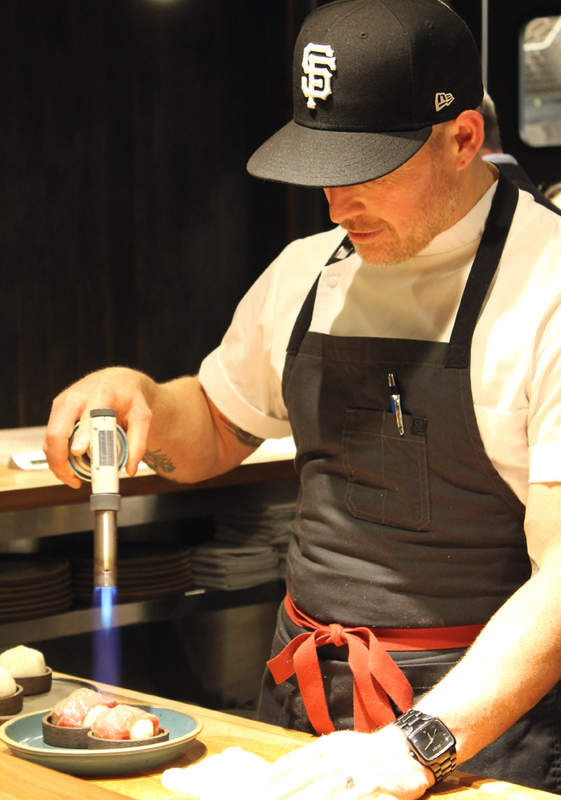 Brown torching the steamed buns. Ready to enjoy, the $25 bao. 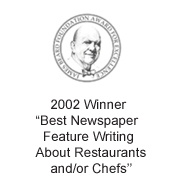 Make no mistake, this is far as you can get from a moderate dining experience. When you come here, be prepared to spend the big bucks. The least expensive cut of beef is an Imperial Wagyu hanger steak at $45. 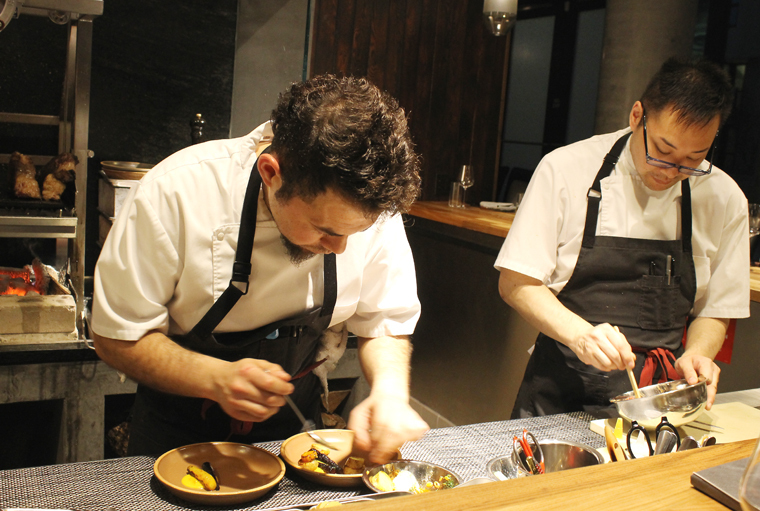 Pescatarians can enjoy a bone-in skate wing with house-made kimchi for $60. When you get into the specialty Japanese Wagyu, be aware that you’ll be forking over $100 to $160 for a four-ounce portion. 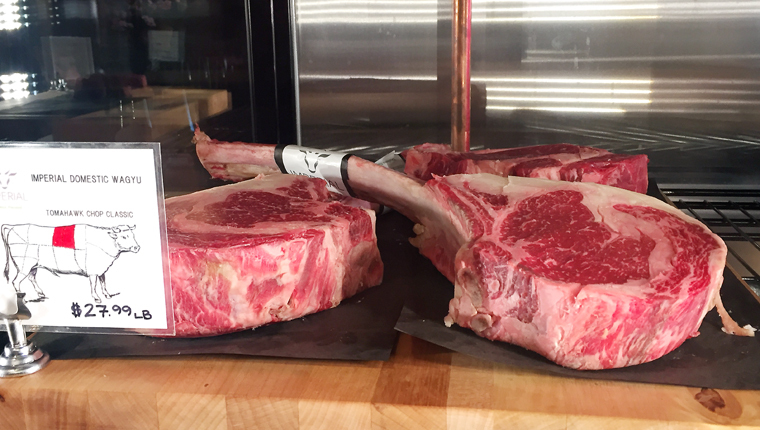 And for insatiable carnivores, there is an Imperial Wagyu tomahawk — which weighs in at 3 1/2 pounds — for $195. 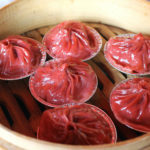 Even an off-menu steamed bun is $25. 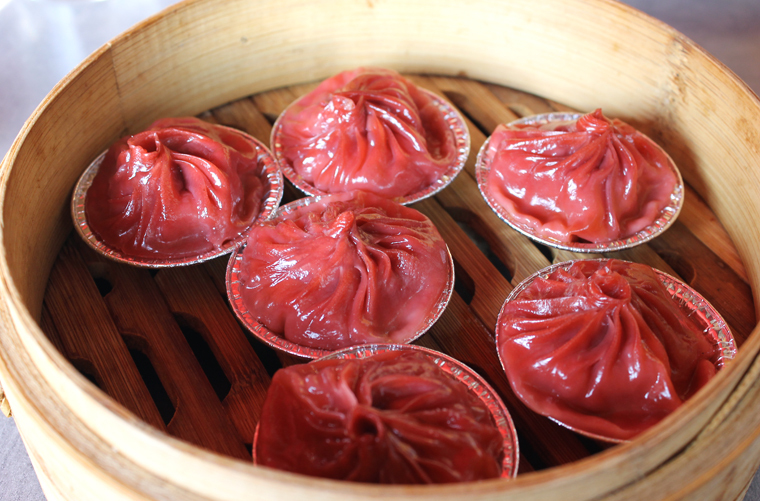 My late-Dad would probably be appalled that a Chinese bao could sport that kind of price tag. But it is filled with braised, shredded A5 beef shank, then overlayed with a paper-thin slice of A5 Takamori (drunken Wagyu) that Brown torches until its deeply marbled fat gets melty. It’s comfort food done luxuriously for one mighty rich mouthful. 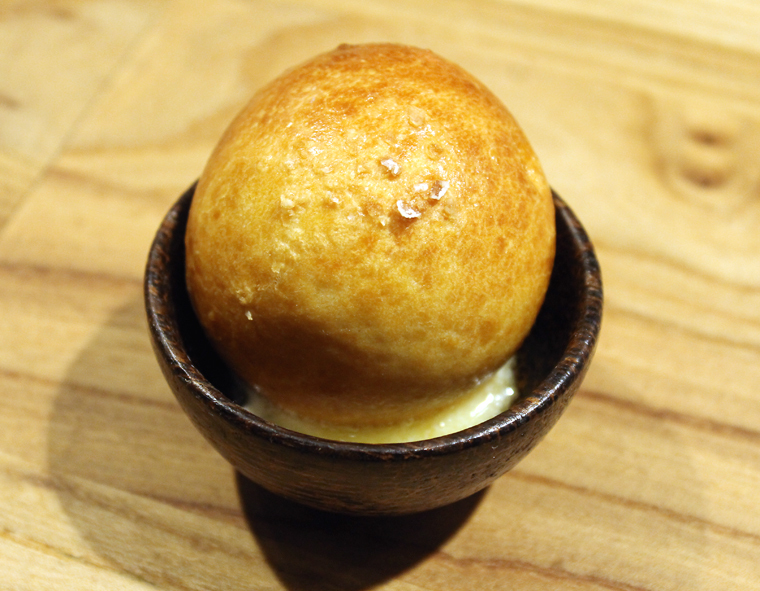 Brioche roll atop a puddle of Wagyu fat-butter. Dinner begins with a gift from the kitchen — a warm, golden buttery brioche bun snuggled in a tiny saucer that has a pool of Wagyu butter underneath that you can gild the lily with. Koji cabbage that’s as pretty as it is delicious. 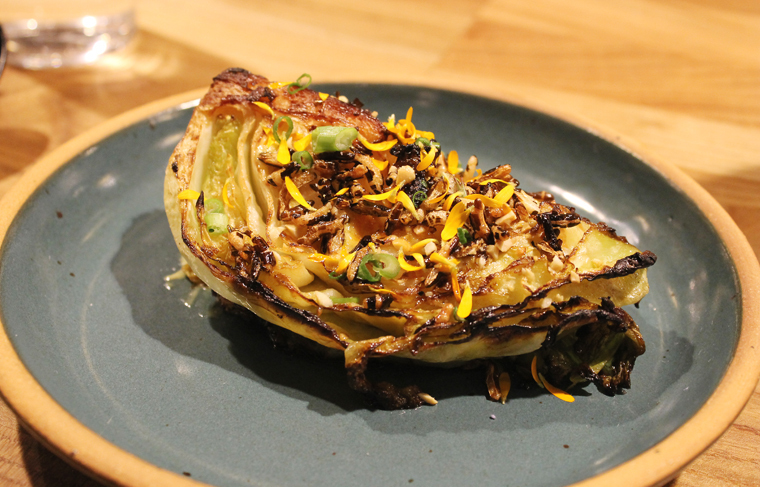 Besides sharing one of those $25 buns, my husband and I started with the 24-hour fermented koji cabbage ($14), a pretty green wedge garnished with baby mustard greens, anchovy aioli, peanuts and crisp puffed rice. The koji gives the cabbage a big hit of umami to go along with its lovely winter sweetness. 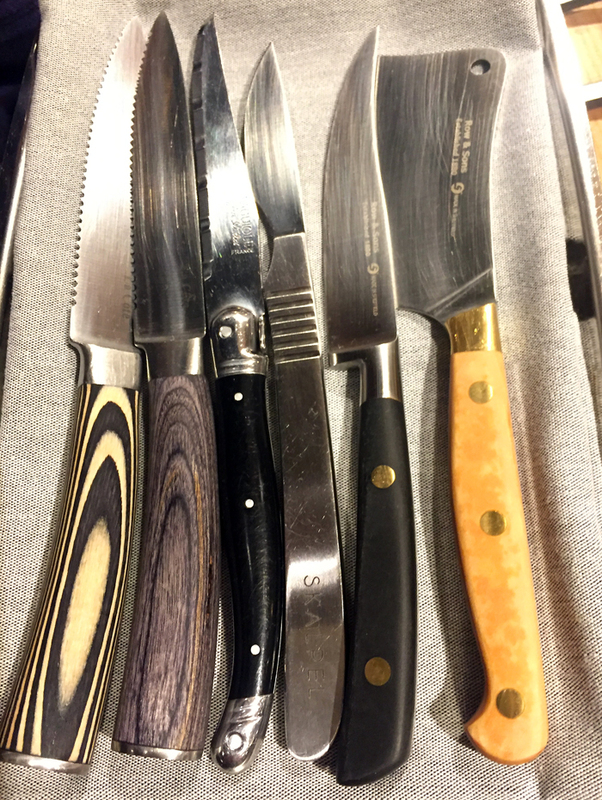 Your choice of knives. I went with the snazzy one on the far left. We decided to try two different beef selections at 4-ounce portions each: the A5 Satsuma tri-tip, which Brown described as his favorite for a big beefy flavor. Few restaurants carry this cut because you have to buy the entire leg to get it, which this restaurant does. 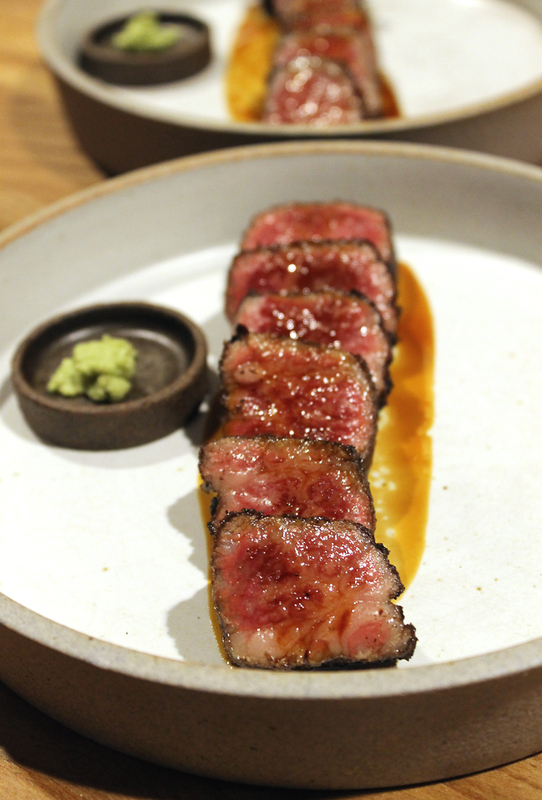 For our second selection, we settled on the A5 Takamori (drunken Wagyu), which comes from cattle that are fed sake mash, the spent grain from making sake. A close-up look at the big grill. Where’s the beef? Right in front of you nearly every second at the counter. And wow, could you ever taste the difference. The Satsuma tri-tip is incredibly tender and supremely beefy and robust tasting. The flavor just explodes in your mouth. The Takamori actually tastes sweet because of the sake mash the cows eat. It’s almost as if it had been brushed with a subtle sugar glaze — even if it wasn’t. It’s just amazing, and was definitely our favorite. 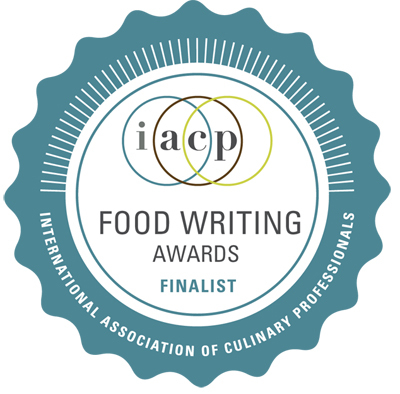 My husband even took to cutting both A5 varieties into tiny dice, savoring each teeny piece one at a time, because he just wanted the experience to last as long as it could. The wasabi acts like horseradish would on prime rib, its nasally heat cutting through the fatty richness of the beef. Sides are $13. The nitro potatoes are worth the carbs. They are like the world’s best home fries. And they take three days to make. The potatoes are first boiled until they start to fall apart, Brown explained. Then they are shocked in ice water, refrigerated overnight, then frozen overnight. They are then dunked into a bath of liquid nitrogen before frying to create a shell that protects the potatoes from disintegrating when plunged into the hot oil. 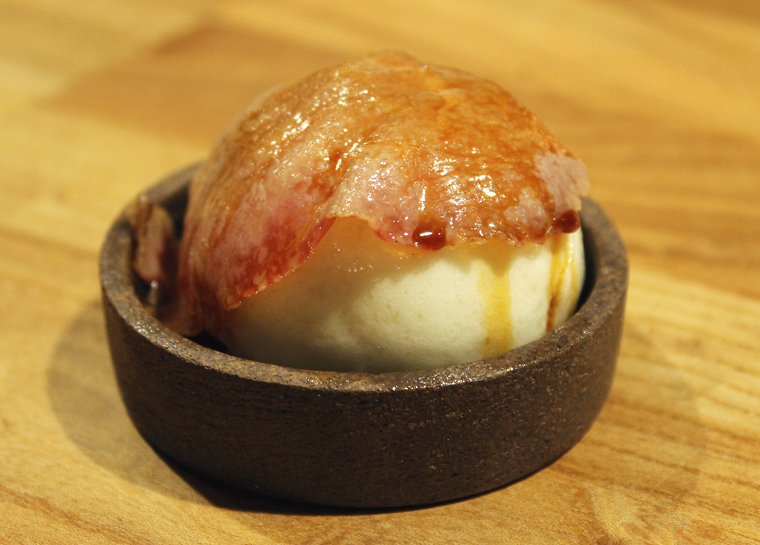 The result is a light, super crisp exterior that gives way to a fluffy mashed-potato-like interior. 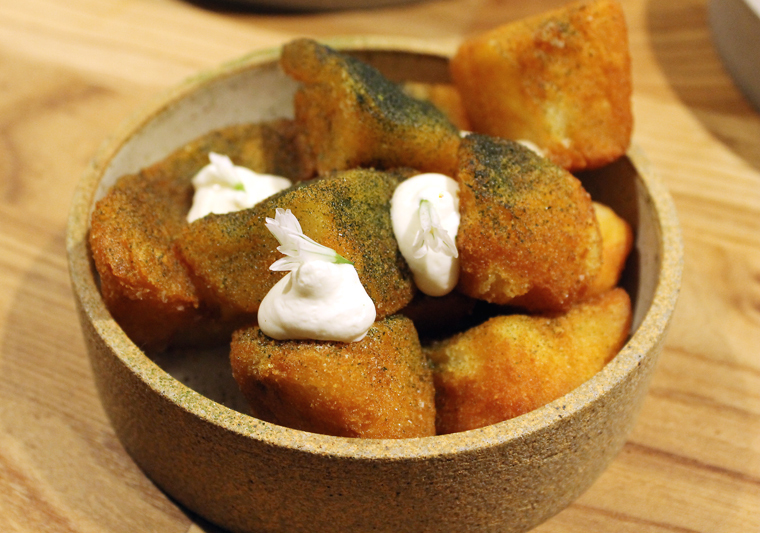 The potatoes are finished with dabs of creme fraiche. You also get a tiny mister to squirt black vinegar on at will. 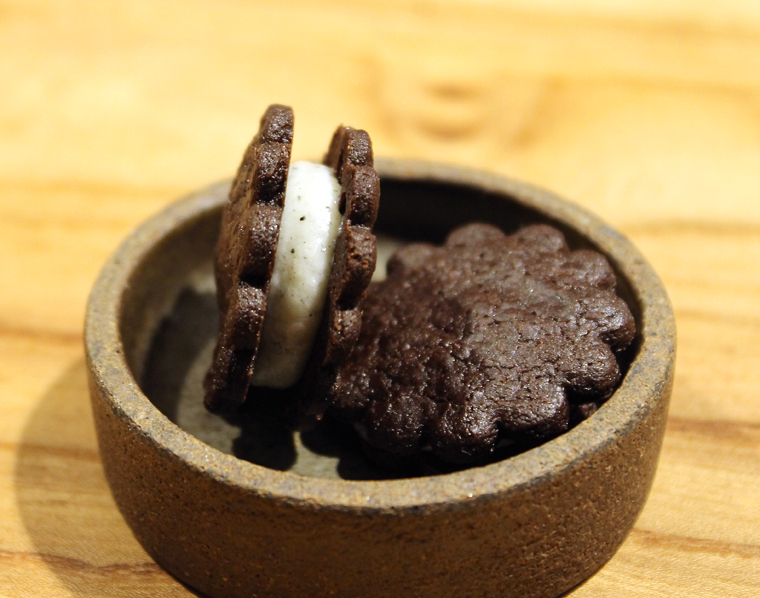 Get ready for a Wagyu brownie. 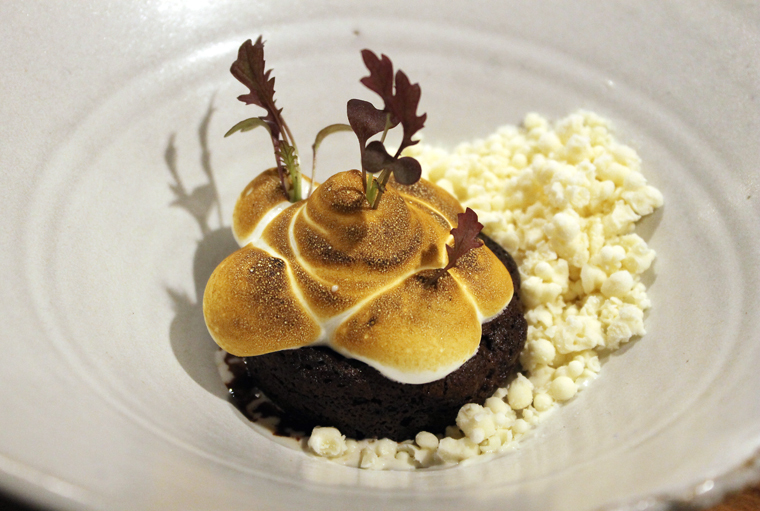 The warm brownie is crisp on the edges and super lush tasting with torched meringue. The dippin dots arrive “smoking” and as cold as ice on the tongue. They are buttery tasting and add just the right amount of saltiness to this decadent dessert. 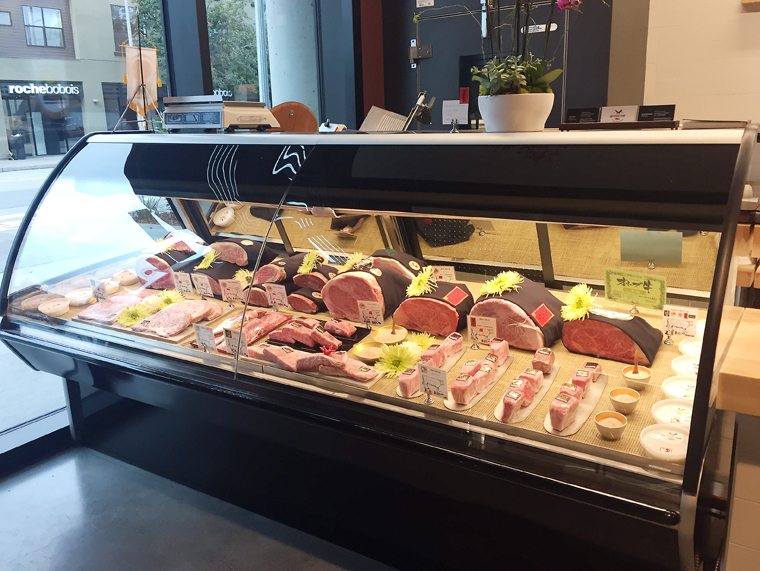 If you’re now hooked on the finest Wagyu, you also can visit The Butcher Shop by Niku Steakhouse, which is right next door. 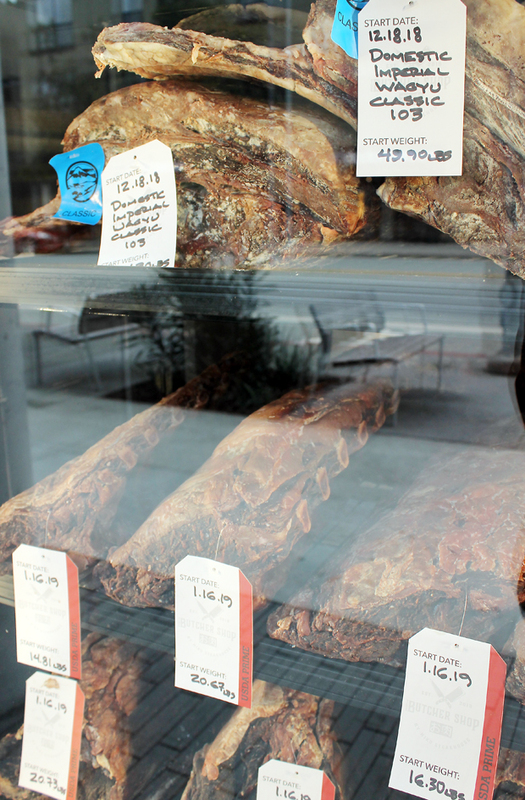 Meat refrigerator cases at The Butcher Shop that are visible from the sidewalk. You can’t miss it as you walk up to it, as its windowed front doubles as the back of the meat refrigerator cases. You’ll find passersby pressing their noses up to the glass to get a better view. The case inside the shop. A closer look at what’s in the case. Head butcher Guy Crims imported 4.3 metric tons of Wagyu beef into the United States just in 2017. His work is readily on display in every cut imaginable in the cases. 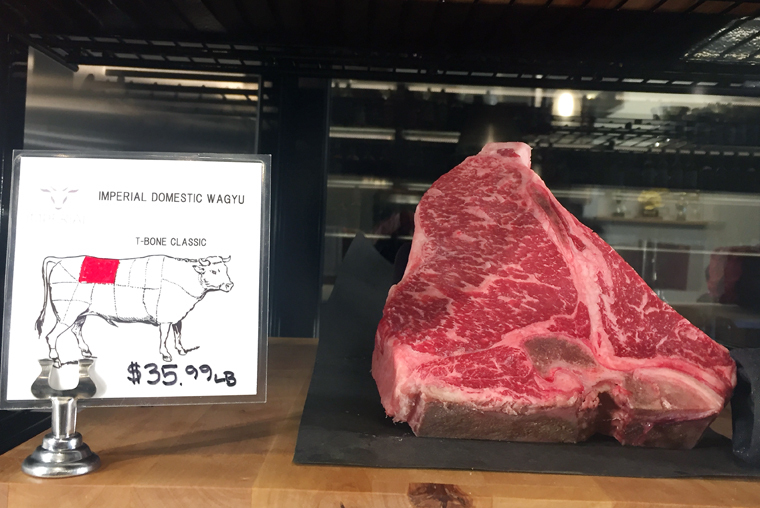 If you’re feeling spendy, you can buy a Wagyu steak or two to take home to grill on your own. Some of the offerings for sale. 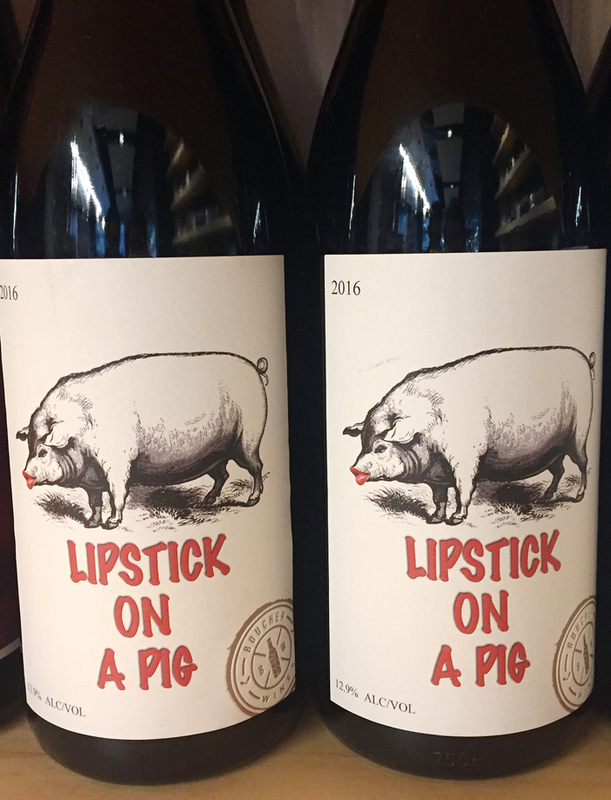 Pick up a bottle of wine while you’re at it. My husband, aka Meat Boy, who of course gets rather obsessive about these things even scoured the Internet after we got home to do some comparison shopping. 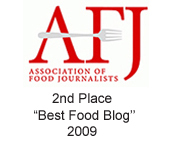 His verdict: As far as Wagyu prices go, The Butcher Shop’s are actually quite good, relatively speaking. So, there you have it — the complete beefy lowdown. 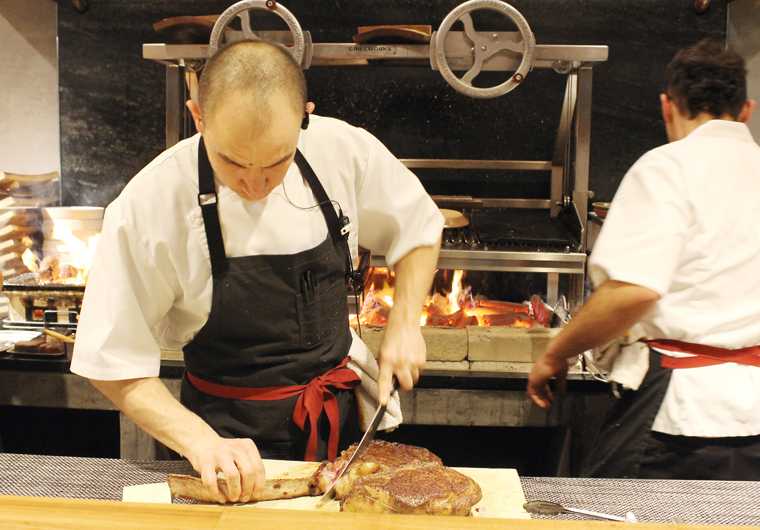 Update: As of March 25, Chef Dustin Falcon, who cooked previously at Lazy Bear in San Francisco and the French Laundry in Yountville, has succeeded Chef Steve Brown at Niku Steakhouse. In what proved to be surprisingly short stint, Brown has returned to San Diego. Looks like a heavenly spot for any serious beef lover. That bun and the nitro taters look so good!